Thursday afternoon we got the call- Jacen needed to come home from school, he had a high fever. I’ve been incredibly lucky with Jacen, aside from his Ehler’s-Danlos he almost never gets sick. He’s had antibiotics less than 5 times in his life- not bad for an eight year old! As soon as I got to the school I could tell this was a different kind of sickness for Jacen. It was a long night, as both Anna and Jacen started showing symptoms. We got an appointment with the doctor the next morning, and got confirmation it was Flu B. (We already had Flu A earlier this season.) Mama grabbed a coffee and buckled up for a rough few days. The kids were prescribed Tamiflu. After my own swab came back positive in urgent care, they sent some in for me too. 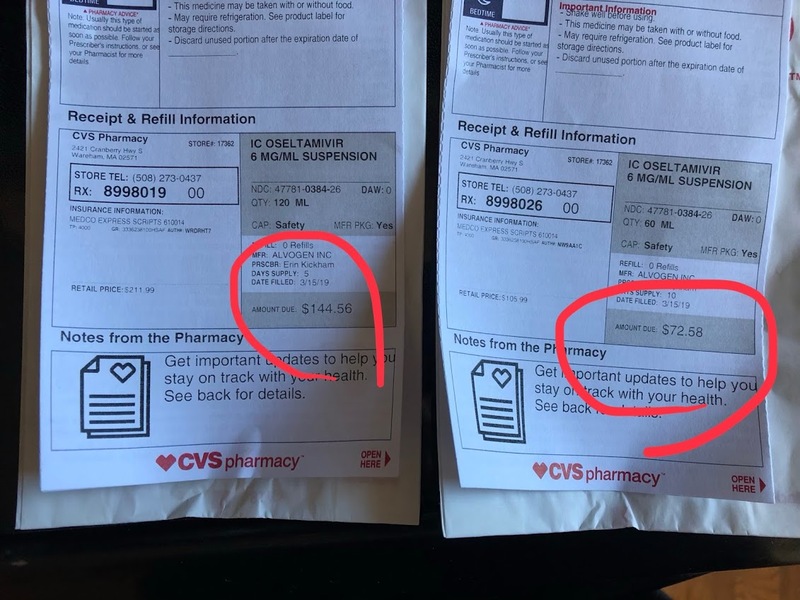 I almost had a heart attack when I saw the cost of the medication. Anna’s prescription was just under $80, Jacen’s $145, Mine was $106. I had to take some time and weigh my options. The first thing I had to consider is that Tamiflu does not “cure” the flu- it treats the symptoms and can lessen the impact & duration of the illness. Second, I asked about generic alternatives- turns out these prices WERE the generic, Oseltamivir . There are no prescription strength alternatives that may be cheaper. Third, I had to weigh the family on a case by case basis. I have no chronic illnesses that may become life threatening with the flu- I would be toughing it out without the Tamiflu. Jacen has a genetic condition, and had a procedure done earlier that week- he was a prime candidate for serious illness with the flu. Anna is a previous NICU baby, with a history of breathing issues. Also a high risk patient for complications. I didn’t have a choice- I took a deep breath and swiped the card. I just had to keep telling myself it was medicine, it was something we needed, and we would figure out another place to cut back this week. The kids got the Tamiflu, I got some extra strength Tylenol. As soon as we got home, I loaded the kids up with Tylenol and their first dose of the Tamiflu. It took about 45 seconds before each child threw the medication right back up. I cried as I cleaned up the vomit, all I could think about was the $250 I had just spent at the pharmacy- all that money and it ended up on my kitchen floor instead of inside my sick kids. I knew I couldn’t afford to let this happen again, so I jumped on Pinterest looking for tips. Unfortunately the medicine has a very strong, bitter taste. It will overpower most liquids it is mixed with. The typical juices are off the table. I found a lot of positive reviews on mixing with coffee creamer, so we gave it a go. My husband picked up a peanut butter cup flavor, and the kids were excited to try it. The creaminess coated the acidity and bitterness of the tamiflu extremely well, and they have not thrown up a single dose since. It’s also been nice that I don’t have to battle with them to take their medicine. They like the taste of the creamer so much that they look forward to it! When I say “Flu” you say “Ids!” FLU-IDS, FLU-IDS, FLUIDS!!! Having the flu draws a lot of fluid out of your body, (sweat, boogers, vomit, mucus, all that fun stuff that makes you want to gag when you read about it!) and the loss of fluid is for a reason! It’s your body’s way of pushing germs and toxins out of your body, and accelerating healing. It’s important to replace the toxic fluids that exit with clean, nutritious fluids.Drink a ton, I mean as much as you can physically handle! In our home we opt for herbal teas, water and electrolyte replacers like gatorade and pedialyte. When those don’t sound appetizing, we offer sugar free pudding, popsicles, low sugar ice cream, broth, soup and snow cones. Dehydration will only make you feel worse, so do your best to keep drinking! This is one of my secret weapons! I learned this trick while working in pediatrics. For a sore throat, make “tea” with a tablespoon of powdered jello mix dissolved into a cup of hot water. (I use sugar free jello and have the same great results.) Drinking the tea will coat the sore parts of your throat and decrease pain. Jello is naturally low calorie and fat free, so it’s a no-guilt way to get some fluids in! In the holistic community, it is believed pineapple juice is five times more effective than over the counter cough syrup. Personally, I’ve adopted a joint holistic and western lifestyle. I still treat my children with Tylenol and Tamiflu, but I also believe herbal teas, spices, and juices will expedite healing. Pineapple juice contains a mixture of enzymes called bromelain, which has strong anti-inflammatory properties. The enzymes soothe a sore throat and help break up mucus. This week Anna has become the poster child for resting while sick. She has not hesitated to stop, drop and nap whenever she needs it. She has fallen asleep on the floor, while standing up, while sitting in chairs, mid conversation, and mid activity. A girl needs her beauty sleep! Even I slept for about 30 hours within a two day time frame. It’s the best thing for recovery! When you sleep, your body is able to focus its functioning power on healing and fighting illness. It also means you’ll sleep through the most miserable of your symptoms. If you’re sick, sleep. Easier said than done, right? Especially for a mom. Take help when it’s offered. If it’s not offered, ask for help. Don’t be afraid to put the babies in a safe place- like a crib or pack and play- and nap when they nap. As always, remember that you can’t pour from an empty cup, and mom needs to heal and recover too. Don’t be confused. Anna contracted both flu A and B this year, and Jacen caught B. We all got flu shots. THIS DOES NOT MEAN FLU SHOTS DO NOT WORK. Flu shots are proven to reduce symptoms and length of illness. They can also be lifesaving for people who have chronic illnesses. Just like with any vaccine, you are not only protecting yourself but those around you. When you choose to get a flu vaccine, you are lessening the impact of the virus for yourself, but also the virus that you may give to others. This is especially important when you are around someone who is chronically ill. Not everyone who is chronically ill appears so, like Jacen and Anna. Both were high risk kiddos, but even our close friends and family may not have realized it. Most of the time sick kids do not look sick. Get your flu shot. Protect yourself, protect others. I am happy to report that we are all on the upswing. I had anticipated that the flu would have us down for much longer, but we have bounced back within just a few days. I hope you and your family are able to avoid the flu this year, but if you do, may it be as minimally painful as possible.